Your story starts with Moovly. A Season’s Greetings video is a fun way to surprise your friends and family with your best wishes for the Holidays. It’s also an excellent way to keep in touch with your clients and to thank your partners and colleagues for a fantastic year. Before you can start creating your own Season’s Greetings with Moovly, you need to sign up. Moovly is an online video animation maker that is entirely cloud-based. There’s no need to download any software, all you need is an active internet connection and a working web browser. Once you’ve created an account, or logged in, you can create a new video on your my Moovs page. Once you have signed up, click “New Moov” and enter a title and description for your video. On the next page, you can pick from a range of styles, but for this video it might be better to select “Just let me in”. A blank project will then open. 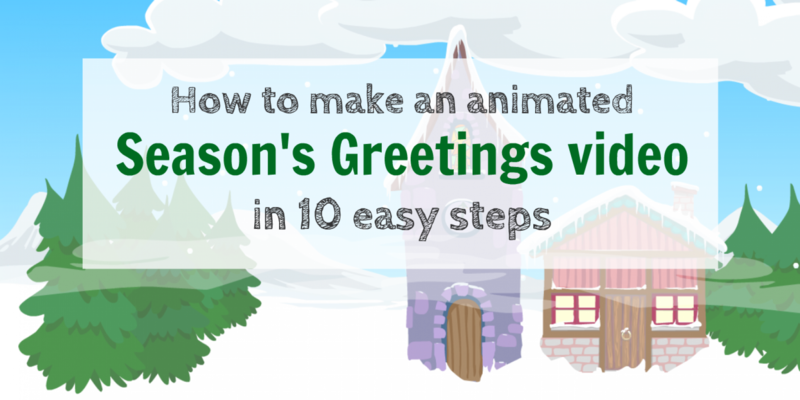 Time to create your Season’s Greetings video. Our Season’s Greetings Library is available to everyone for free. You can also access some of our other libraries if you need more animated assets. The Moovly library has tons of assets for you to enjoy and use in your Season’s Greetings video. Just find an object (or import it to your Personal Library) and drag it onto the Stage. Once you have started to create your video, you can add appealing animated effects to your objects on the Timeline. Wipe in, fade out, pop in, flip out, there are various fun effects for you to use. Music goes a long way when it comes to video. Import your own sounds or select one from the Season’s Greetings Library to spice up your video. Now that your video is ready, save it and close the Editor. Publish your finished Moov to the Moovly Gallery and proceed to share it directly with your friends or colleagues! Join over 1 million Moovly users right now. It's Free!